Do you want to work on OpenStack networking? The position has been filled, thank you for all of the applications! I’m looking for a Software Engineer to join the Red Hat OpenStack Networking team. I am presently looking to hire in Europe and Israel. The candidate may work from home or from one of the offices listed here. The team is globally distributed and comprised of talented, autonomous, empowered and passionate individuals with a healthy work/life balance. The candidate will work on OpenStack networking projects such as Neutron and LBaaS. The candidate will write and review code while working with upstream community members and fellow Red Hatters. If you want to do open source, Red Hat is objectively where it’s at. We have an institutional culture of open source at all levels and this has a ripple effect on your day to day and your career at the company. One of my personal highlights of the recent Barcelona Summit was a session by Mirantis engineers Elena and Oleg titled “Is OpenStack Neutron Production Ready for Large Scale Deployments?”. In the session they outline a comprehensive control and data plane testing effort, run on two labs, one with 200 nodes and run of the mill hardware, and the other with 378 and top of the line hardware, all running the Mirantis distribution based off Mitaka with standard ML2/OVS, DVR, L2POP and VXLAN. In the session they show near line-rate speed for east/west and north/south routing with jumbo frames and VXLAN offload enabled. They were also able to spawn 24,500 VMs across 125 networks without errors and low CPU consumption. Can the Neutron reference implementation scale? You bet your tush it does. It's come a long way since Diablo. Turning our eyes to adoption, the OpenStack Foundation conducts a usage survey every 6 months. Looking at the April 2016 user survey, we can see that ML2 with Open vSwitch and Linux Bridge dwarf other solutions. https://www.openstack.org/assets/survey/April-2016-User-Survey-Report.pdf, slide 41, taking out “ML2” and “nova-network”. 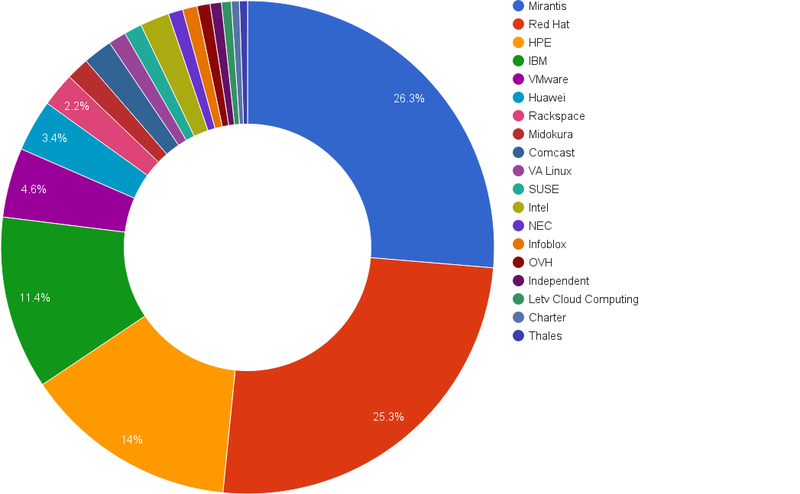 Examining the openstack/neutron project via Stackalytics we see that ML2/OVS has a rich and robust community with 20 companies contributing over 5 patches in the Newton time frame. 779 people have contributed at least 1 patch to Neutron since its inception, 215 of which during the Newton timeframe. Some of the effort targeted the base Neutron platform, e.g. configuration options, database work, versioned objects, quotas or other in-tree ML2 drivers such as SRIOV. Looking at the contribution of everyone who has committed at least 5 patches in the Newton cycle, we are left with 50 authors, 42 of which contributed at least 1 patch to ML2/OVS. Looking at the interactive version of the OpenStack user survey we can see that ML2/OVS is the most popular choice by an order of magnitude regardless of deployment size. And so to answer the question: “Is OpenStack Neutron ML2/OVS Production Ready for Large Scale Deployments?”. Yes, it is, of course it is. It has been for some time now. I’ve observed a persistent theme across valuable and successful CI systems, and that is actionable results. How do you determine that a job failed? How are the results presented to the relevant developers? Can developers do anything about a failure? To bring it to concrete terms let’s take a look at how Rally is used in upstream jobs. This is not a criticism of the Rally project itself, which I’m a big fan of, but rather how it’s used upstream. It uses the standard upstream CI infrastructure, which is a miracle of engineering when it comes to correctness tests. The infrastructure spins up VMs from a node pool comprised of many clouds. It then uses devstack-gate and devstack to install OpenStack and runs several Rally scenarios. When the result of a CI run is True or False, the variance of hardware and congestion levels is irrelevant. However, when you’re trying to measure performance, variance matters. You can try setting a maximum, and any result over the maximum is declared as a failure, however with a variance sufficiently large setting up SLAs is an exercise in futility. Let’s look at a recent Linux Bridge change  that cannot impact Rally results (The Rally job is setup to run against Open vSwitch). Consecutive runs would ideally show the same results. However, looking at the results of patchsets 10, 11, 13 and 14, we can see that the total length of the job runs between 60 and 83 minutes. The full duration of the create_and_list_ports flow runs from 1517 seconds to 1887 seconds. The average for a single create_and_list_ports execution runs between 4.58s and 5.29s. What am I supposed to do with the results of the next run? What can I learn from it? I’d argue: Nothing. The results of the job are not actionable. The result is that the job has been non-voting ever since its introduction and worse yet, none of the engineers I work with look at its results. The next step would be to give up on the idea of gating or blocking performance regressions and instead detect them after the fact. We can do that by persisting historical results, graphing them and spotting trends. It’s clear that with a variance this large, the results would not be actionable either. To demonstrate this, let’s turn to the fantastic openstack-health project. Looking at the Neutron API test with the longest average run time  we can see that at the time of writing, the test ran 249 times in the past month so we get a great sample size. However, the run time graph looks like a Jackson Pollock painting, with a min of just under 5s and a max of just over 9s. Looking at the graph it’s clear we can’t clean up the data via statistical Jiu Jitsu either. When consistency matters, I don’t think you can get around a dedicated bare metal setup. The Gerrit interface does a great job of presenting CI results, and a failing voting job forces developers to look at its results. However, I don’t know many engineers who look at CI results as a form of amusement. Post-merge and periodic CI runs in to these issues – They burn your favorite form of fossil fuels and drain the life force of the fine folks who maintain it but the results are often not presented in a consumable manner. Running the tests reliably is as important as making sure the intended audience is aware of the results. One solution could be to make sure the relevant developers subscribe to a mailing list, triggering a mail on failures filtered after distracting infrastructure issues. Periodic CI can only be valuable if it’s actionable and developers are held accountable and demonstrate a persistent urgency to failures. If you want to do open source, Red Hat is objectively where it’s at. We have an institutional culture of open source at all levels and this has a ripple effect on your day to day and your career at the company. You will work with a talented, autonomous, empowered and passionate team of people with a healthy work/life balance. The ideal candidate is familiar with cloud, networking, Linux, Python, open source, or some combination of the above. You may work from home or from one of our offices listed here: redhat.com/en/jobs/locations. That’s how it usually works, anyway. Other people are not so lucky and have to learn the basics like they learn anything else: Read a book, then another one. Meet with some people, ask some questions. Practice it, learn it on the job, wing it. It’ll be alright.